Centrifugal pump is commonly used in the process of oil exploitation, but there is no need to use it in each oil field and every oil well. Usually, the centrifugal pump only used in special conditions where common machine used in oil exploitation can not solve the problem. Now, we will discuss about the conditions details one by one. The first condition where needs sand pump is that in some oil field, the sediment concentration of the decanter centrifuge fluid out of the oil well is in massive amount. Some oil well even has no fluid in the process of sand wash over. So a sand pump is needed. 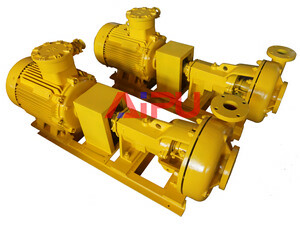 The second condition where needs centrifugal pump is some particular oil field. The geological conditions of the oil field are different. The soil around some oil well might be loose. Therefore, the sand content of the drilling fluid out of the oil well might be high. To make the matter worse, accidents like oil well is buried, worn or blocked by sand happen frequently in these oil fields. Thus, a sand pump is very necessary in this kind of oil field. It can not only help to improve the oil content of the drilling fluid, but also to protect the operator from getting into the soft sand. Besides, a centrifugal pump can help to improve the whole working efficiency of the oil exploitation. The third condition where needs sand pump is desert area. We all know that the soil of the desert districts is sandy. But petroleum is often discovered in these areas. The exploitation of desilter in desert is more difficult than other place. Among of all the instruments and machines, a centrifugal pump is particularly necessary in desert places. Without sand pumps, various problems might cause the increasing high cost of oil exploitation and the low work efficiency of the machine. Centrifugal pump is widely used in oil exploitation, but it is not necessary for every oil field. That where needs centrifugal pump is depended on actual conditions where the oil well locates. If you need to get more information about centrifugal pump, please feel free to contact us. What is drilling mud shear pump?